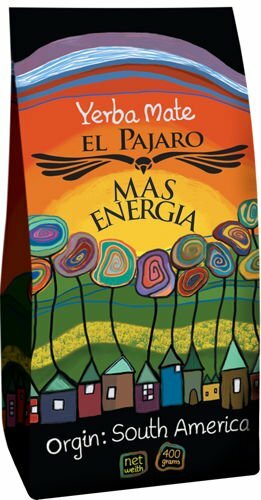 Paraguayan yerba mate El PAJARO MAS ENERGIA is a strong, traditional elaborada. This package is full of life-giving strength that will improve your concentration. This is a proposition for those who appreciate the classic taste and the traditional way of preparing the infusion from yerba mate. It is collected on clean, unpolluted plantations in the ITAPUA department in the vicinity of the Reserva Nacional Reserve - Parque San Rafael, which is a remnant of the Atlantic Rainforest, so extremely important for the entire Earth's ecosystem. EL PAJARO is not modified in any way. It is an ideal alternative to coffee, because it excites equally well, instead of rinsing the body with magnesium. MAS ENERGY, unlike its Paraguayan sisters, is characterized by a smaller amount of bitterness. It provides the precious energy that it accumulates in its shrubs on the sunny plantations of southern Paraguay. EL PAJARO is a rich source of polyphenols and vitamins from the group B. It maintains its flavor for up to seven floods for a long time.